The entire Mississippi Supreme Court was present in Long Beach on Feb. 16 to welcome Justice David M. Ishee as the newest member of the court. 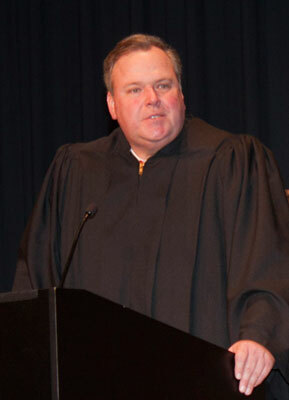 “I promise to serve this office with integrity and honor and to make you proud,” Justice Ishee told officials, friends and well-wishers who packed the Fleming Education Auditorium on the Gulf Park Campus of the University of Southern Mississippi for his investiture ceremony. Justice Ishee, 54, of Gulfport, took the oath of office at the Supreme Court in Jackson on Sept. 18, 2017. It is traditional to hold a formal investiture ceremony later. Chief Justice Bill Waller Jr. administered the ceremonial oath. Justice Ishee said that he decided that he wanted to be a lawyer when he was 10 or 12 years old, after watching Gregory Peck portray Atticus Finch in the movie adaptation of To Kill a Mockingbird. His mother gave him the book the next day. Doris Ishee watched proudly from the front row during the investiture. He explained his venue choice for the investiture. His father, the late Rep. Roger G. Ishee, was a member of the committee that helped found the USM Gulf Park Campus. Justice Ishee teaches business law and ethics there. Attorney Roger E. Ishee of Lafayette, La., recounted his brother’s legal career which started as a municipal court judge in Pascagoula at age 29. “That’s a long way from city court to the Supreme Court,” he said. Along the way, “he has sat in every chair in a courtroom in Mississippi.” He served as a prosecutor, defense attorney, trial judge and appellate judge. He served on the Mississippi Court of Appeals for 13 years. Chief Justice Waller said, “Justice Ishee brings a lot of value to the court....He brings that real life experience.” His private law practice included trying four death penalty cases. He argued cases before the appellate courts. Chief Justice Waller noted that Gov. Bryant has appointed three members to the Supreme Court – Justice James D. Maxwell II, Justice Dawn Beam and most recently, Justice Ishee – and has made a total of 22 appointments to state courts. “The judiciary is better off because of his careful attention to this,” Chief Justice Waller said.